However, this is not a bug. It is just that in the form, there are questions/fields that were set as *Required fields but is hidden on the form. 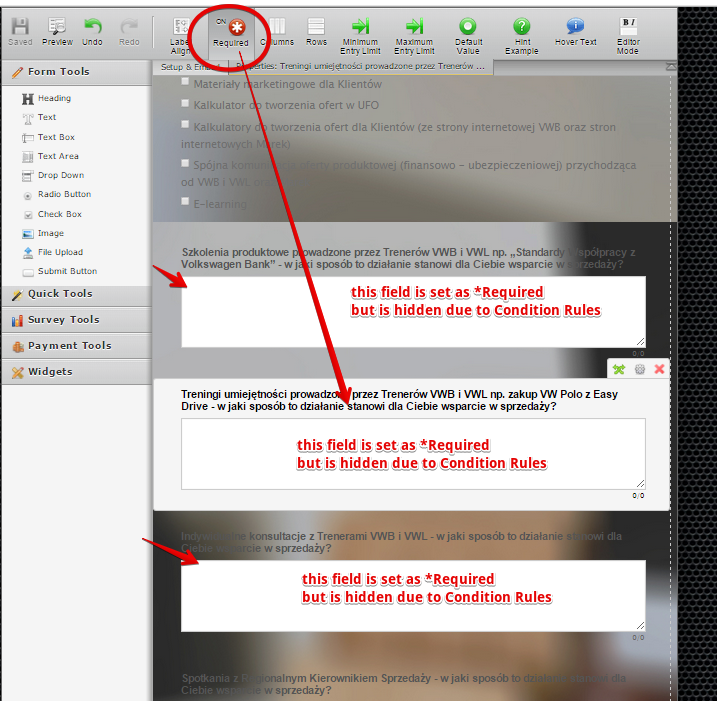 I suggest you remove the *Required options for the fields that were to be hidden by condition rules. This should resolve the conflict and will allow advancement of the form to Next page. The thing is that I had them on required before and it worked. It is just after I added a minimum 5 character limit validation that it stopped working.. So it cannot be it. I guess there is some error with Characters / Required validation, but why would it work if they were required but now when they are required + 5 minimin signes on them they don't work? Could you please look into it further? I would like to have them both required and 5 minimum signs if possible. 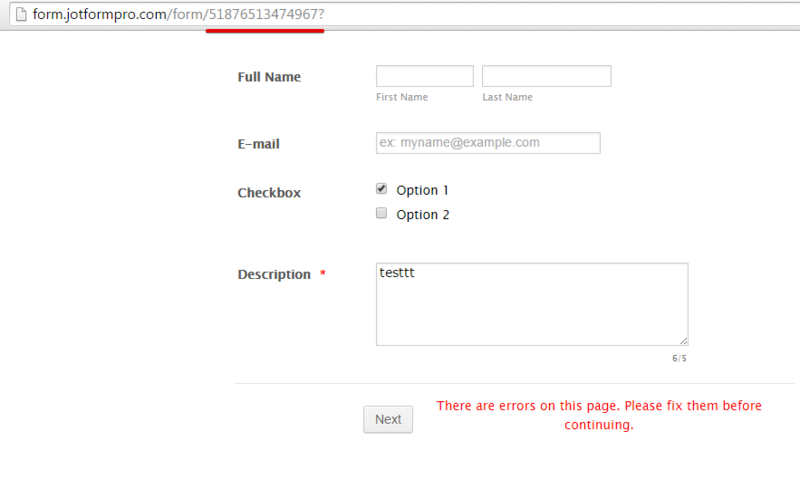 After the 5 requirment fields I cannot even send it even though I've filled out the form, so the error must be somewhere . Thank you for testing further. I also made a test using 2 same form with only the difference on the other one having Min Entry Limit enabled for TextArea field. To test my forms, just click on the Checkbox option to show the hidden fields. Or leave uncheck and click on NEXT button. 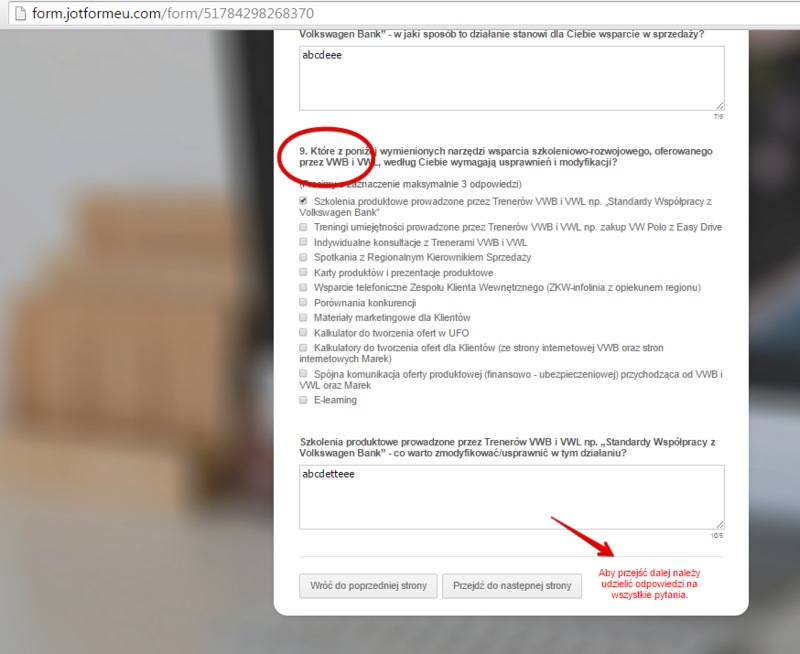 1. with Min Entry Limit - http://form.jotformpro.com/form/51876513474967? 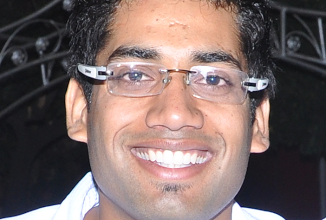 2. without Entry Limit - http://form.jotformpro.com/form/51877154888978? Allow me to do further test and find out what is the cause for your form to behave like this. I will post update here as soon as I can. I replied too soon.. I was able to reproduced the glitch on my 2nd test form that have Min Entry Limit enabled http://form.jotformpro.com/form/51876513474967? so this is a bug. It must be another effect of the glitch in the Min/Max Entry Limit feature of the TextArea field. I will send a report bug to our higher team support due to this. W will let you know here on the updates. My colleague have already reported this issue to our back end team. Unfortunately, we have not received any update from them. We will get back to you as soon as this issue is fixed.